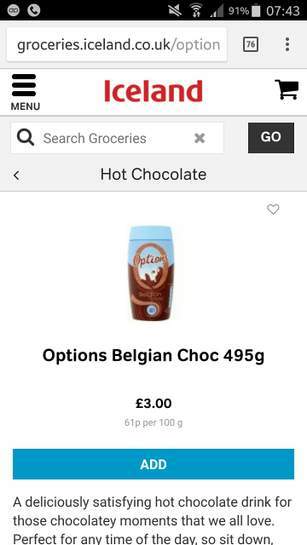 You can purchase Options Belgian chocolate jar220g from waitrose at half price £2. Instant hot chocolate drink with sugars and sweetener UTZ certified cocoa. Gluten free. 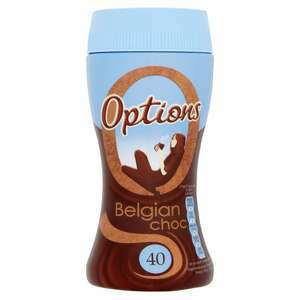 Suitable for vegetarians.A deliciously satisfying hot chocolate drink for those chocolatey moments that we all love. Perfect for any time of the day, so sit down, relax and enjoy. Don't buy this - it's 43% sugar and full of gum based thickeners. You're better off buying cocoa powder - makes a much better drink.